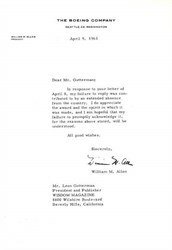 A letter from the president of the Boeing Company apologizing for not responding to a letter from Leon Gutterman, President of Wisdom Magazine. William M. Allen was born in Lolo, Montana, and graduated from Harvard Law School. During the 1920s, he joined the law firm providing attorneys for the Boeing Airplane Company and became a member of the company's board of directors. He served as company president from Sept. 1, 1945, to April 29, 1968, taking the helm when the end of World War II brought production to a standstill. Allen guided Boeing back to success, from the era of propeller-driven aircraft into the age of jets, intercontinental missiles, and spacecraft. William Allen is credited with making the decision for Boeing to base the company's future on a new commercial jet transport, the world renowned 707. Nearly one thousand of these were to fly the world's airways. Soon followed the 727, the 737, and the largest commercial jet, the giant 747. This total of nearly three thousand aircraft comprised over 50 percent of the world�s jet transport fleet. These aircraft have carried the supremacy of the U.S. aerospace industry into every corner of the globe while revolutionizing the international transportation systems. Much honored, he retired after his distinguished 47 year aerospace career in 1972. Allen was an innovator who encouraged diversification, and he helped create The Boeing Company's place in the U.S. space program. He became chairman in 1968 and chairman emeritus in 1973. In 1978, the board named Allen honorary chairman. He died in October 1985.